(HALIFAX, N.S.) 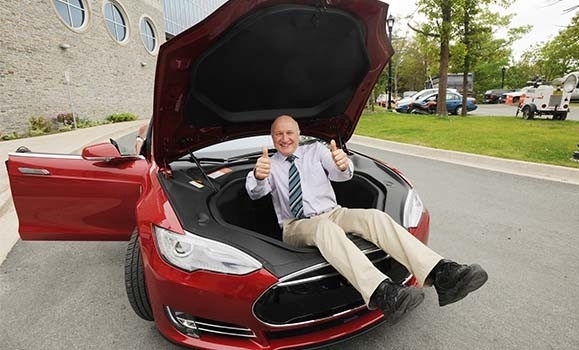 – June 17, 2015 – Dalhousie University and Tesla have signed an agreement that lays out the terms of a new five-year research partnership with Dalhousie lithium-ion (Li-ion) battery pioneer, Dr. Jeff Dahn. The agreement was signed June 16, 2015 and the exclusive partnership with Tesla will begin in June 2016. It marks the first collaboration between Tesla and a Canadian university. In a presentation to Dalhousie researchers and representatives Tuesday morning, JB Straubel, Co-founder and Chief Technology Officer with Tesla, discussed the importance of the Li-ion battery to the company. Tesla’s mission is to accelerate the transition to sustainable transportation around the world. To do so, it plans to expand beyond a niche market and produce hundreds of thousands of cars a year. In an effort to bring down the price of Tesla vehicles for the mass market, Tesla will manufacture Li-ion batteries with longer lifespans that cost less to create and be sourced with more materials from North America. Over the next year Dahn will continue to work as the Industrial Research Chair in Materials for Advanced Batteries, which is funded by 3M Canada and the Natural Sciences and Engineering Research Council of Canada (NSERC). That research partnership will come to an end in June 2016 and the exclusive partnership with Tesla will then begin. Dahn has 25 researchers in his lab, including graduate students, postdoctoral researchers and technical staff. This next generation of battery researchers will be involved in the Tesla agreement and with that, given invaluable exposure to a leading industry partner. Dalhousie University is Atlantic Canada’s leading research-intensive university and a driver of the region’s intellectual, social and economic development. Located in the province of Nova Scotia, Dal’s 18,000 students and 6,000 faculty and staff foster a vibrant, purpose-driven community. Across 13 faculties, Dal researchers and students conduct more than $135 million in funded research each year with hospitals, industry, governments, non-profit agencies and universities around the globe. Through learning and discovery, Dal is committed in its quest to make a lasting impact on our world.